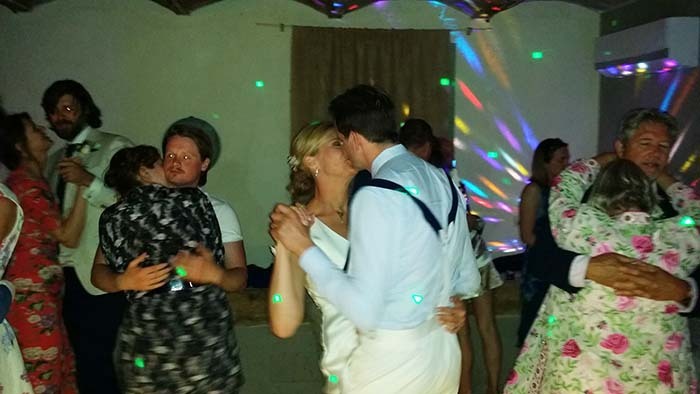 The videos show Guty & Simone live during an English wedding at Locanda in Tuscany – Case Sparse Moro Fiacchi, 13, 53023 Bagno Vignoni – Castiglione d’Orcia, Siena. Alexandra, (“Honor” to her friends) and Alexander are a beautiful young couple from London and guests too are all English with a few Irish; with the inestimable help of Claudia and Veronica of the venue they have very well organized the whole wedding day inside Locanda in Tuscany estate. All the music is managed by Guty & Simone “the Italian wedding musicians and Dj”: they set up a sound system (audio mixer, active loudspeakers, wireless microphone etc..) under the gazebo by the pool where ceremony takes place; service opens playing “Outro” by M83 for the bride walking down the aisle and closes playing “Home” by Edward Sharpe and the Magnetic Zeros. A wedding with Guty & Simone. For the post ceremony aperitifs they play a playlist expressly created by the spouses for the poolside drinks and canapes and then provide a sound system + wireless microphone in the dinner area for some “Italian style” background music and for the speeches; for the after dinner party they set up their main sound system + instruments + lights system + dj gear inside the Locanda and , after the romantic first dance “Wild horses” by Rolling Stones, they start a great LIVE music and DJ set and make all guests dance all the evening!!! 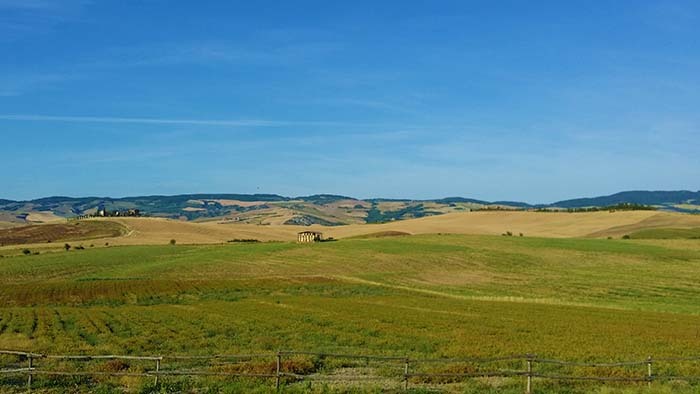 in the middle of nowhere with beautiful views of the surrounding Tuscany landscape it’s located in a world heritage area with historical Roman baths within walking distance and access to the Val d’Orcia and Pienza, perfect base to explore the region. 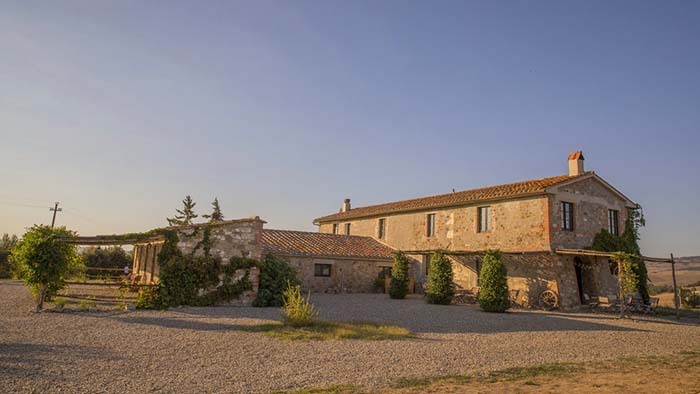 You’ll find a swimming pool shimmering under the Tuscan sun, the view on the soft hills and the large vineyard and the surrounding Val d’Orcia valley and Mount Amiata. 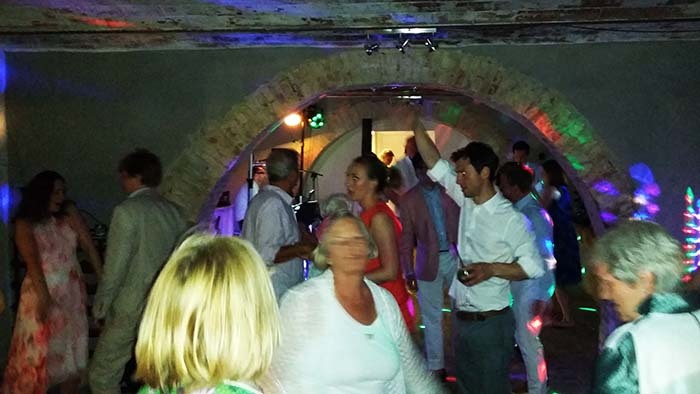 Fisrt dance during the wedding at Locanda in Tuscany Castiglione d’Orcia.